Sometimes catfish of the month is late because I have a lot going on and I don’t get around to it promptly. Sometimes it’s late because I don’t have one “in the back pocket” to publish in a timely fashion when it should be published at the beginning of each month. Less commonly, it’s late because I have not selected a catfish in my mind and have to force one in there. Some might say this shouldn’t be too hard as there is a fair amount of space available. However, I often find myself agonising a bit too much over the decision and this causes delay. This month I went through the cat-elog a few times, rounded on a species of madtom and wrote an introductory paragraph and then, because I have also in the past written a new CotM only to find it was for a species already covered, checked I’d not done it already. I was nonplussed to find it had already been ably covered by Heok Hee Ng in 2004. I told you there weren’t a lot of little grey cells firing on all cylinders! Selection, I thought, better not do yet another pleco? How about avoiding South Americans for a month or two? Easier said than done when I was faced with few fish that I felt I wanted to keep for longer before I wrote about them. South America it was then and Corydoras perhaps? Well there are quite a few already and I don’t have much new to say there either and then I thought about Trachydoras. It’s really quite Corydoras-like but it belongs to the family doradidae also known as thorny or talking catfishes. Excellent, I knew Trachydoras steindachneri was the fish for this month! 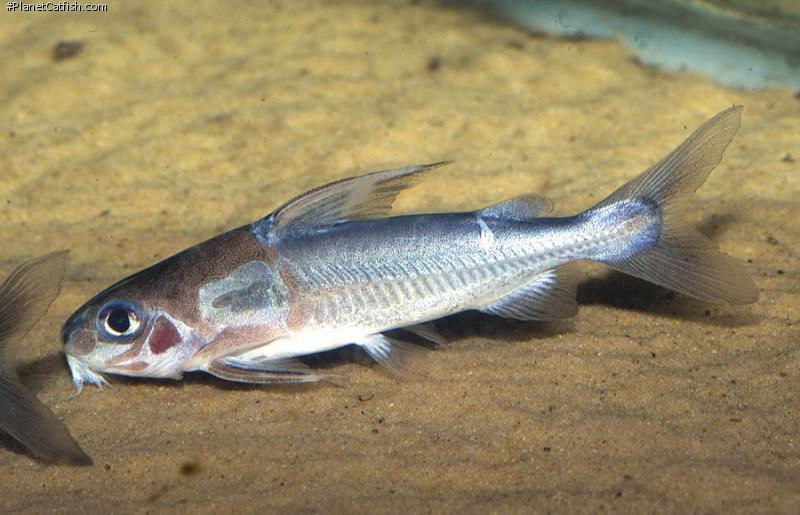 T. steindacherni belongs to the half of the talking catfish family that don’t talk much — hence the family’s common name of thorny catfish is better. This group of genera tend towards gun metal grey colouration. A bit of colour or patterns in the fins is about all you can hope for in the cosmetic department. However, our featured species makes up for these shortcomings by being an active swimmer and can be observed during the day. During a trip to a fish exporters in Iquitos, Peru in 2000, I found one of these fish as a bycatch and took it home with me. As I write this in February 2010, it’s still happily nosing around a medium sized tank. I kept it with smaller fish with no problem at all (it is itself relatively small for a catfish getting no larger than 9cm TL in my time with it) and has mostly been kept with Brochis and Woodcats — I also kept it with Apistogramma for a few years even raising fry of the latter in the same tank. My only regret with this species is that I have never seen it for sale locally and could not observe their behaviour being kept together. Based on the behaviour of similar genera, I think they would shoal like Corydoras, and perhaps even reproduce in similar fashion. Although not colourful they have a nice form, with an elegant light coloured row of tiny thorn plates along both flanks and a cute stubbiness that is accentuated by their small but feathered barbels. They also have a pleasing, slightly hooked adipose fin. If I do ever get a group of these I will try them in a low slung, larger footprint (not higher than 15”/ 38cm tall but at least that size if not more front to back) planted tank with little current and a large shoal of hatchetfish to add interest. There will be plenty of refuges (a little more stone than wood) and I will keep them over sand. While I have kept my sole individuals over fairly rough gravel for years without damage, it looks most at home gently feeling the sands surface for morsels of pretty much any food you offer excepting primarily vegetarian fare which is not appreciated. As it doesn’t eat or dig up plants, and isn’t too bothered by enough light to grow them, then this fish balances well with a good looking planted tank. I don’t really know why this fish isn’t more available. I would say in terms of shipping it to be no more delicate than wild caught larger Corydoras. In numbers they’d be an interesting project but I guess they would be a little more expensive than Corydoras, a little harder to catch and a little less likely to sell for these reasons and for the lack of colour. It’s a shame as I, for one, would like to understand more of their clearly social behaviour. Type Locality Río Beni, Upper Amazon, Bolivia.